Sadly, the below message was posted on Marty Tousley’s grief blog this August. Our hearts go out to Marty and her husband as they grieve the passing of their beloved dog, Beringer. Marty has helped so many of us walk the difficult path of grief over the years and she continues to do so in her eCourses, eBooks and discussion forum. Our heartfelt condolences to you, dear Marty, as you yourself walk this difficult path once more. 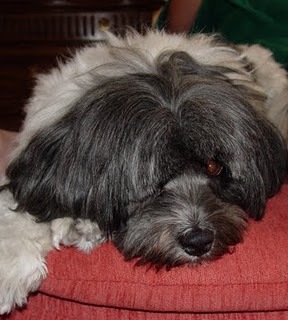 This entry was posted in Grief Healing - Pet Loss and tagged loss of pet, pet death grief, pet sympathy, support grieving dying pets by June Cook. Bookmark the permalink. Thank you so much for this touching and heart-felt video message of love, honor, and inspiration to carry on in the spirit of gratitude for the time spent and love given and received from our beloved pets! My eyes are filled with tears as I write this message to you. I apologize if the words are not very intelligent. Just know that that I thank you for this opportunity to help me along my grief journal over the tragic accident and loss of my 6 week-old kitten Eli Henry Singletary. Peace and love be with you always!